Feel Bach! 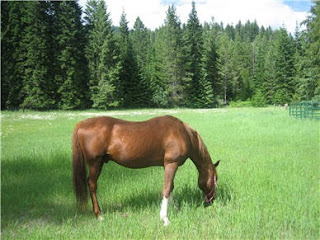 flower remedies blog: Did the new horse need Feel5ive? Did this beautiful little guy need Feel5ive? I put some in the water trough, but no, I don't think he needed it. He seemed curious about his new surroundings, but perfectly calm about the change. Mostly, he was interested in all that green grass! Was Feel5ive still useful? Oh yes. For me. This horse hadn't been ridden for several years, and I hadn't ridden for 2 years, so when I decided after a few days that he'd settled in and it was time for a ride, I was the one who was nervous. Horses can sense that and sometimes react negatively, so a dose of Feel5ive before saddling up was just the thing. And what happened? He was a perfect gentleman. As soon as the weather cools a bit, we'll go for some longer rides. If you're facing an event that makes you nervous, and even happy things can make you nervous, calm yourself with Feel5ive. If it's a really stressful event, start taking it the day before, then be sure to take more in the morning, and more just before you have to face whatever is scaring you.